The fast, easy way to knit! No knitting experience necesasry. Knit beautiful sweaters, afghans, pillowcovers and more. 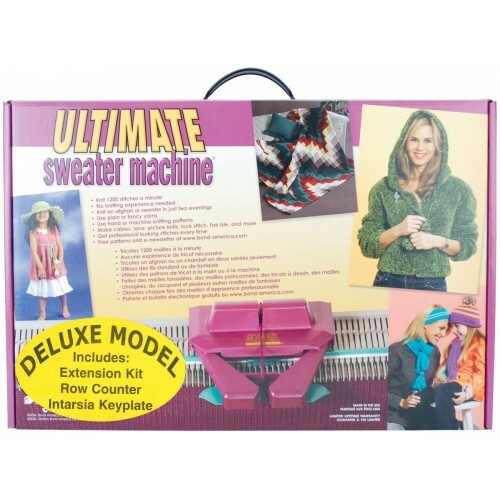 Inlcudes the knitting machine, the deluxe kit, Sweater Extension Kit (Usually $59.95 seperate), Row counter and Intarsia Key plate. Can knit eyelet/lace, Fair Isle, tuck stitch cable, intarsia and many more kinds of stitches. Knits straight from a ball or skein of yarn. Extension Kit—make an even larger sweater or afghan! Comes in portable carrying case, similar to a large briefcase & weighs just 10 pounds.